Today has been fabulous. I’m lucky to be travelling with some excellent companions: David Williams, Susy Atkins, Hamish Anderson and Emma Wellings. They are unlucky to be lumped with me. 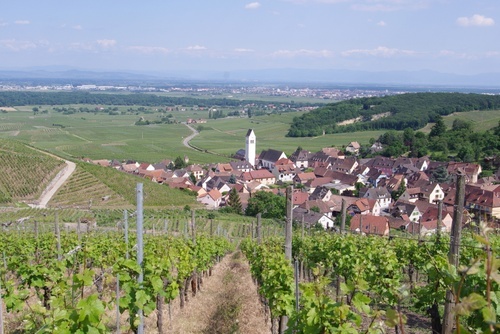 We set off early for the impossibly beautiful village of Kientzheim, where Domaine Paul Blanck is located. I’m told that by Alsace standards, Kientzheim is pretty average. I think it’s lovely. We went for a long walk through the vineyards at the back of the village, with Philippe Blanck. There’s the granite Grand Cru Schlossberg, and then the lieur dits of Grafreben and Altenbourg, and finally Grand Cru Furstentum. We tasted the wines at the top of Furstentum and then headed back to the winery for an al fresco lunch that included some lovely old bottles. Paul Blanck is making some impressive wines. 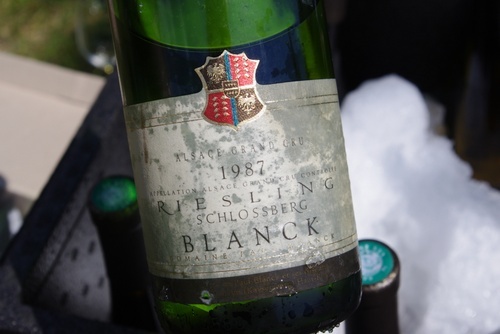 Lots of highlights, but a shout out for the Schlossberg Grand Cru Riesling: 2008, 1987 and 1998 vintages tasted, all brilliant. And I loved various Furstentum wines, including a complex old vine Gewurztraminer from 2007, a 1985 Riesling and a 2005 Pinot Gris. A vineyard of many talents. 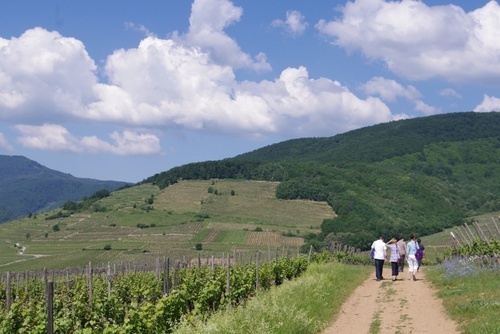 Then we headed off to Katzenthal to meet biodynamic grower Clemens Klur. There was a big party taking place, and we only just managed to talk ourselves out of a walk through the vineyards with a comedian dressed as a monk, and instead settled for a tasting with Clemens. The wines here, made from 7 hectares of vines on the steep slopes around the village, were superb. 2009 Riesling and 2010 Pinot Gris from the Grand Cru Wineck Schlossberg vineyard were sensational. 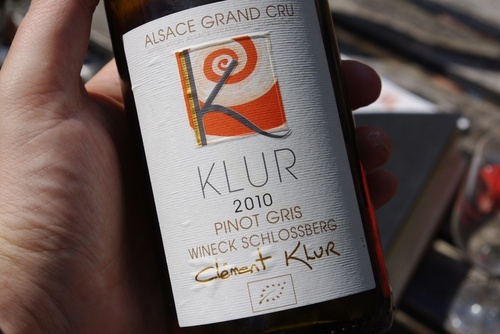 Klur’s regular Gewurztraminer 2009 is a rich, brilliant wine. And he makes two super Pinot Noirs: very pale in colour, but fragrant, mineral, light and complex. 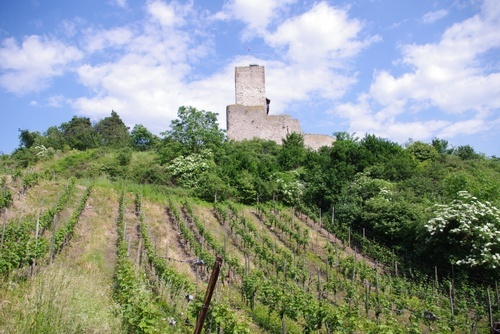 After the tasting we walked up to the Wineck castle, of which only the 12th century keep still remains. I really like Riesling, haven’t had the chance to taste many, but it’s a great white wine…there’s a white wine made in Portugal and Spain that it’s equally good or even better to me than riesling, it’s the alvarinho “albariño”. But what does it misses in this great wine to be considered a great grape? Of course you have tasted both, what’s the diference? 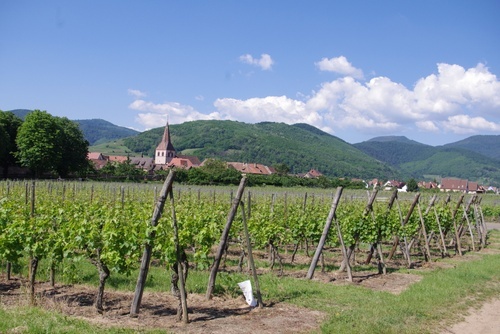 Alsace definitely makes some of the best Rieslings in the world! Don’t forget to stop in Ribeauville. 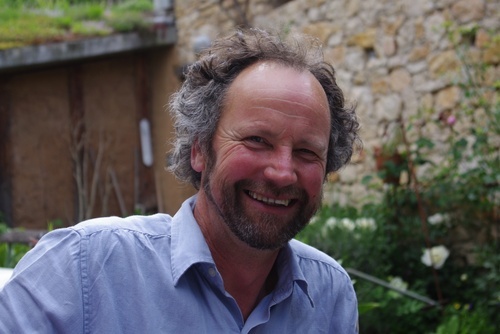 Clemens Klur’s wines do not seem to be readily available on the UK retail market. 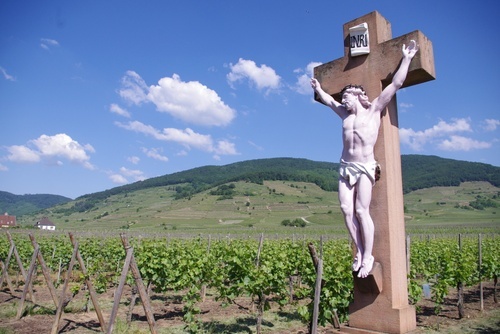 We offer three of their wines for home delivery including the Gewurztraminer 2009. Trust it is okay to quote your blog on our site.